New EcoBoost engine makes the power grade. The 2015 model year will bring yet another new engine to the Ford product line, a 2.7-liter V-6. That engine follows four-cylinder engines displacing at 1.5- and 2.3-liters, being utilized in the Ford Fusion and Lincoln MKC respectively, as well as in other models. 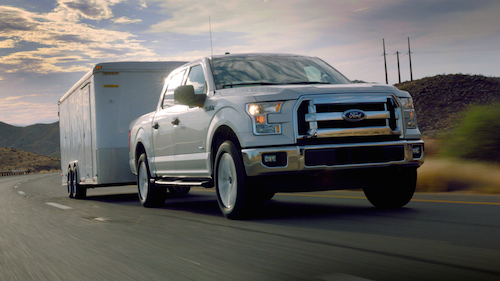 Ford puts the new F-150 through the paces in Arizona. All three engines are based on Ford’s proprietary EcoBoost technology, what marries direct injection, turbochargers and variable valve lift timing to produce more powerful engines on a smaller footprint. The 2.7-liter V-6 will be introduced in the 2015 Ford F-150 when it goes on sale this fall. Last week, Ford shared some information about the new V-6, including horsepower, torque and towing details. What it did not offer were the truck’s fuel economy estimates, expected to come in somewhere around 27 mpg. That would make the F-150 the most efficient gas-powered, full-size pickup truck on the market, coming in just shy of the Ram 1500 equipped with a 3.0-liter turbo diesel V-6. Ford is not simply relying on a smaller engine and vehicle light-weighting to improve fuel mileage for 2015. It is introducing automatic start–stop technology for this pickup truck line too. Just as it is found elsewhere, the technology will shut the engine off when the vehicle comes to a stop. The moment the brake is released, the engine restarts immediately. The advantage here is in the reduction in both the amount of fuel consumed and emissions released. Ford has also designed the technology to deactivate whenever the vehicle is towing or is operating in four-wheel-drive mode. The new EcoBoost engine is not the standard engine in the 2015 Ford F–150. A normally aspirated 3.5-liter V-6 engine replaces the previous 3.7-liter V-6 used in the 2014 model. Ford says that the standard engine has a maximum payload of 1,910 pounds and a maximum tow rating of 7,600 pounds. The standard engine features twin independent variable camshaft timing along with direct acting polished mechanical buckets. Other efficiencies were realized by updating the bearing caps, the forged steel crankshaft as well as the exhaust manifolds. While Ford certainly has both Ram and Chevrolet in its crosshairs as it updates its most popular model, this truck manufacturer has also taken on a midsize truck from Toyota when releasing its numbers. Specifically, Ford noted that both its F-150 and the Toyota Tacoma offer engines displacing at the same size, namely at 2.7 liters. Ford noted that its engine produces more than twice the horsepower, torque and towing capabilities of its smaller competitor. The Ford also has an 825-pound edge in the payload department. Essentially, Ford may be demonstrating that while it does not have a smaller truck to offer customers, it has a larger truck that sizes up well against both large and smaller competitors alike. The Ford Motor Company is looking to retain its place as the best-selling pickup truck in America, a feat that is approaching 40 years running. It is making a big, some might say risky move, to go with an aluminum body truck for the new model year. But it may be just the effort Ford needs to maintain that position going forward. Photo courtesy of the Ford Motor Company. Third van model for Ram brand arrives in 2015. The Ram ProMaster City is a small Fiat in disguise. With Chrysler separated Ram from Dodge, the move was deemed by some as a curious one. Especially with a line up that consisted solely of midsize, large and heavy duty pickup trucks. The Ram Dakota occupied the midsize segment, but was canceled in 2011. The next year the Ram Cargo Van, based on the automaker’s minivans, made its debut. Still, the product line was a thin one until Fiat-supplied models began to appear for the 2014 model year. That first model, the Ram ProMaster is based on the Fiat Ducato, a larger van that competes with the Nissan NV, the Mercedes-Benz Sprinter and the upcoming Ford Transit. By early next year a second model, the Fiat ProMaster City, will debut and serve as Ram’s small commercial van. Based on the Fiat Doblo, the latest Ram offering will compete with the Ford Transit Connect and the Nissan NV200. 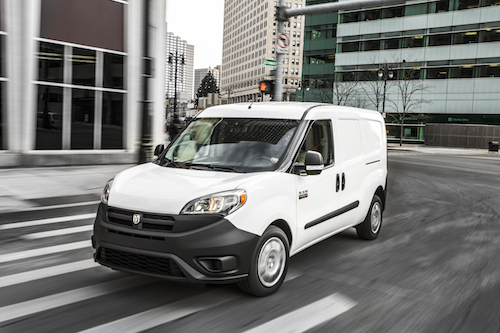 The 2015 Ram ProMaster City will be available in eight different configurations including cargo and wagon variants. Security panels, rear and side windows are among the differences between each model. Commercial versions will seat two people, while the passenger models will seat five. Under the hood, each model is powered by a 2.4-liter four cylinder engine and paired with a nine-speed automatic transmission. It is rated at 178 horsepower at 6,400 rpm and makes 174 foot-pounds of torque at 3,900 rpm. The van is built in Bursa, Turkey, and then sent to the Chrysler Group Transformation Center in Baltimore, Maryland for final upfitting. The Ram ProMaster City will give this model several important edges over its competitors. Although fuel mileage projections have yet to be announced, the ProMaster City is expected to beat out the combined 24 mpg of the Nissan NV200. Other areas where it will lead include its wheelbase measuring 112.4 inches, the distance between its wheel wells at 48.4 inches, 131.7 cubic feet of cargo volume and 1,883 pounds of payload capacity. Ram also claims wider and taller cargo doors than its competitors. The Fiat Doblo model that the Ram van is based on is not a new one. Indeed, Fiat has sold more than 1.3 million units for a van that has also won International Van of the Year honors twice. Now in its third generation, the front-wheel drive Doblo is a proven scheme that should work well in North America. Even so, the ProMaster City will provide a number of changes over its Fiat equivalent. Due to the rougher road surfaces in North America, ride height will be raised slightly by 0.4 inches. Chassis components and anchor points will also be upgraded. To accommodate the TigerShark engine and the transmission, the engine box and front track are widened. A number of structural upgrades will help this vehicle comply with stiffer US safety regulations. All models will be equipped with 16-inch all-season tires to manage increased weight loads. The ProMaster City is of unibody construction and front-wheel drive. This layout helps to reduce weigh, lower maintenance costs and improve efficiency. The Ram also benefits from optimal cab and cargo space, very good handling, enhanced traction and greater payload capacity. The City will also have a 2,000-pound towing capacity. A number of features found in other Chrysler Group models will be offered in the Ram as well. For instance, the automaker’s UConnect interface is available, what allows for hands-free calling by way of Bluetooth technology. A five-inch color display with navigation, an available backup camera and a ParkSense audible warning system are other attributes of this new-to-Ram van.